The gelatin in the bones can help people with leaky gut syndrome. These patients have porous intestinal lining, and the broth helps seal those up which can help ease chronic diarrhea, constipation and even some food intolerances. For those without leaky gut syndrome, it can help reduce inflammation. Cartilage in our bones wear down as we age, but substances found in bone broth like collagen and chondroitin are some of the building blocks used to construct cartilage. Over time, studies have shown collagen is an effective way to support joint health and prevent joint deterioration. Collagen can also help improve skin’s elasticity and fine lines. Amino acids found in bone broth can help boost the immune system which will help you feel better and fight illness when you’re sick. In a modern diet, many people are deprived of nutrients that keep us healthy. 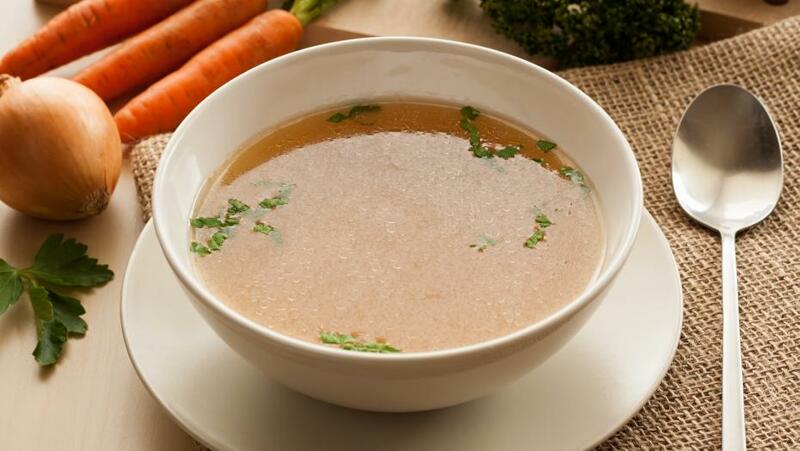 Drinking bone broth is an easy way to get minerals absorbed by your digestive system as opposed to taking vitamins in pill form which can be difficult for some people to digest. While you can use any beef or chicken bones, bones like beef knuckles, chicken necks, oxtails, soup bones and chicken feet are best, since they have the most collagen. Your local butcher can help you! Place the bones in a crockpot along with onions, carrots, celery, salt and pepper. Feel free to add in extra herbs. Add water to the top, and cook on low for 24 to 72 hours. For faster cooking, you can use a pressure cooker.